What price would you pay for a clean car? If you’re based in Dublin and you order a full valet of the interior and body, you’re looking at upwards of €80. If you do it yourself with the items featured in this article, you could achieve similar results on multiple occasions for far less, with the potential for significant savings over time. 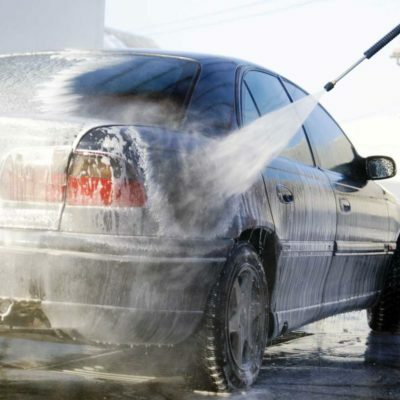 The key to doing a great cleaning job on your car is understanding that every material requires special treatment. With this in mind, we’ve tested separate cleaning products for tyres, windscreens, bodywork and more. If you’re anything like us, you’ll also be glad to know there’s plenty of hardware out there to help do the cleaning for you – especially handheld vacuum cleaners, pressure washers and electric polishers, all of which are featured in our review. Is it weird to say we absolutely loved using this wheel cleaner? Well, we did. Meguiar’s Ultimate All Wheel Cleaner makes an immediate difference as it hits the rubber of your tyre and the metal of your hubcap, kicking up a deep, rich scent that gives you the sense this is a cleaning product that clearly means business. After waiting a few minutes while the suds turn purple, rinse off with a hose or pressure washer to reveal the drastically transformed wheels underneath. A little additional scrubbing may be required to get rid of the most stubborn dirt. All in all, this was one of the most impressive products we’ve reviewed in recent weeks. It has one job to do, and it does it superbly well. Streetwize’s portable power washer is perfectly suited to domestic car cleaning. The user creates the pressure in the washer using its pump handle, then directs the flow of water using its nozzle. There’s also a brush attachment for the end of the hose, which enables you to keep pumping water through as you scrub off stubborn dirt. An electric power washer may provide more force, but this hand-pumped option will do far better for both the environment and your household budget. 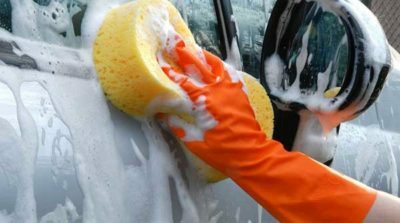 For the best results, first wash the car with water, then brush with a mixture of water and pressure washer fluid (see below), before rinsing off with another load of fresh water. This simple, effective and neutrally-scented pressure washer fluid from Simoniz does a great job of lifting dirt from your car exterior (or from patios, bikes, caravans and many other surfaces besides). We simply poured some into the Streetwize Portable Power Washer, mixed with water, pumped it onto the car – and off came the dirt with some light brushing. Simoniz’s SAPP0060A fluid would be a particularly smart choice if you have lots of different things to clean, and not a lot of space or shopping time to accommodate specialised cleaning solutions for each one. Is there any space more awkward to vac than the inside of a car? Footwells, dashboards, cupholders and the mysterious regions beneath the seats all lend themselves well to the accumulation of detritus, and horribly to being cleaned. Dyson’s Car Kit is a set of hand vac attachments, specially designed to winkle out dirt from a place like these. Its flexible crevice tool was a great help in picking up dust off the dash, while the two attachments tipped with stiff brushes helped lift stubborn dirt off the floor. It’s a little pricey, but this premium-quality kit will earn you a decent amount of cleaning time back in the long run.